"are there any comfortable earbuds?" I used to listen to music more or less every waking moment. I had a tape player I'd lug around on my bike and headphones and the whole world had a soundtrack. I got pretty good with making mix tapes, especially when my brother brought home a little mixer so I could work between 2 CD players and fade them. Over time I've come to appreciate silence more, particularly when I'm working, but I still pull out the player when I go traveling. If I could afford an MP3 player, I'd probably get one of those. The biggest complaint I had was that the headphone wires get snarled. Eventually they always end up twisted so much it looks like a braid, even if the cords aren't in knots. 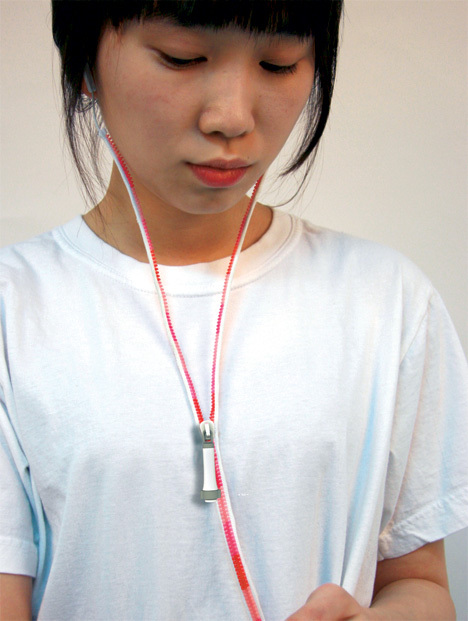 I figured that by now we'd all have remote headphones so we wouldn't have to deal with cords but the I-Pod ads made cords seem cool to hipsters and easily influenced advertising viewers so here we are. Until those remote jobs become more feasible and cheaper, there's the zipper headphones. 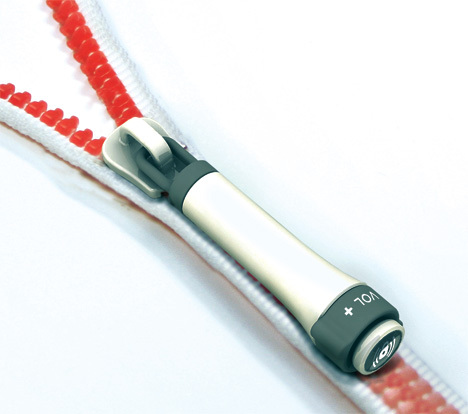 Yanko Design has crossed a zipper with ear buds in a simple good idea. Basically you can zip the two cords up into one for storage and leave the separation as wide or short as you desire with the controls which are a pull for the zipper. There's no reason someone couldn't come up with a radio headset that consisted of nothing else, but these are meant for MP3 players. I love this kind of invention, its one of those "well that's kind of obvious" things that you only recognize as obvious once someone else has thought of it.